Secretary John B. King Jr., Assistant Secretary for Civil Rights Catherine Lhamon, and student leaders have roundtable discussion during national It’s On Us Week of Action. U.S. Secretary of Education John B. King Jr. met with Claremont McKenna College student leaders on Tuesday, Oct. 11, to discuss efforts the CMC community is taking to prevent violence and sexual assault. Secretary King’s visit to CMC came during the national Week of Action organized by the It’s On Us campaign against sexual assault on college campuses. At CMC, the week was marked by a number of events, including a “How to Support Survivors Discussion,” a screening of the Netflix documentary Audrie & Daisy, and discussion groups on when consent has or has not been given. Accompanying Secretary King on his visit to CMC was Catherine Lhamon, Assistant Secretary of Civil Rights in the Department of Education. Secretary King’s visit was spurred, in part, by CMC student Lindsay Burton ’19, who is a member of the national It’s On Us Student Advisory Committee. Burton is one of 28 students from U.S. colleges and military academies on the committee. The committee urges students to take the lead in the battle against sexual assault on their campuses and mobilize peers to push for cultural and systemic changes. The Department of Education asked Burton and Nicky Blumm ’17, President of the Associated Students of Claremont McKenna College (ASCMC), to plan a roundtable conversation with Secretary King, Assistant Secretary Lhamon, and a small group of CMC students to get candid perspectives on how to end sexual assault. 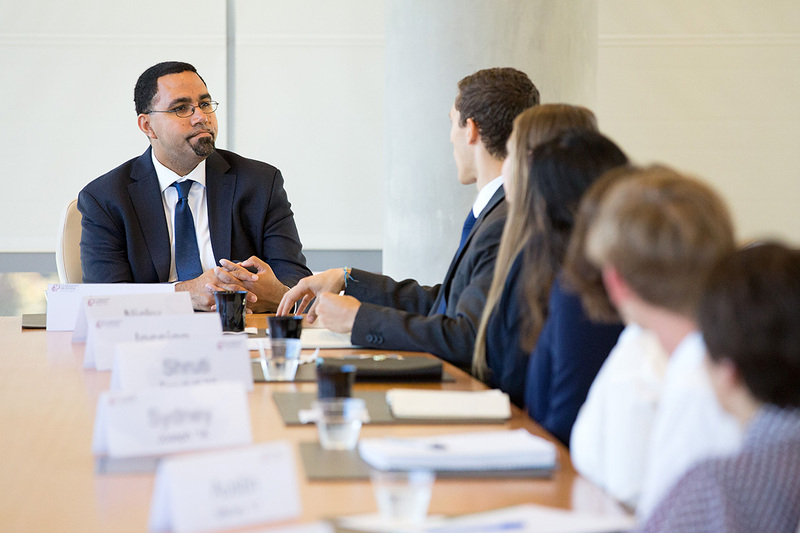 “The goal of today’s conversation," Secretary King said after the meeting, "was really for us to try to learn from the students what their experience has been as campus leaders; what they see on campus that’s working and what they see that isn’t working." One CMC effort that students described and that particularly impressed Secretary King and Assistant Secretary Lhamon was the Personal and Social Responsibility (PSR) initiative. Both officials said the initiative is consistent with the goals of It’s On Us. The College launched PSR in 2013-14, under the leadership of President Hiram Chodosh. In the spring of 2014, the Claremont McKenna College community joined in the Mirza Summit on Personal and Social Responsibility. This series of dialogues engaged students, faculty, staff, and alumni in order to draw attention to challenges facing college campuses and to reinforce a shared commitment to a campus community in which all students can thrive. In fall 2014, the College formally implemented the personal and social responsibility committees of students, faculty, staff, alumni, and parents to combat challenges including sexual assault. As a result, CMC increased its efforts to ensure that the College has clear policies and processes for accurate and fair adjudication of incidents of sexual misconduct. The College has also enhanced care and support resources for any person who has experienced such misconduct. To advance CMC’s understanding of sexual assault on college campuses, CMC joined in a national survey developed by the Higher Education Data Sharing Consortium (HEDS). Most critically, CMC has committed efforts and resources to prevention and training. President Chodosh emphasized the priority of “student, peer-to-peer leadership on programs, training, and other significant committee work,” as evident in PSR and the It’s On Us campaign. Blumm, the ASCMC President, echoes the need for the community to take a stand. "More than anything, I think when we decide to reject misogyny, sexism, and perpetrators of either, we will truly begin to build a community that prevents sexual assault," he said. Nyree Gray, CMC Assistant Vice President for Diversity and Inclusion and Chief Civil Rights Officer, believes the College is on the right track. “A lot of our programming has been in partnership with students about educating the community about positive consent culture, and I think those have been the most impactful programs,” Gray said.